Ixtur MRP-170 is a pneumatically controlled neodymium permanent magnet that is suitable for gripping parts with different shapes. The compact size combined with high gripping force makethem versatile for various applications including: lifters, grippers, fixtures, production automation, robotic solutions, end-of-arm-tooling, etc. MRP-170 is capable of handling both round and flat parts, which is usually problematic for magnet grippers. 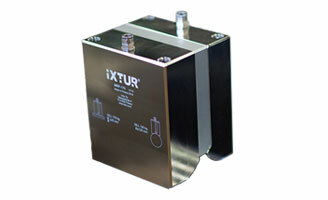 Ixtur magnets do not change their magnetic state if compressed air is lost – e.g. in case of a damaged hose or compressor malfunction. This feature provides reliability and safety to material handling. Unlike vacuum lifting solutions, Ixtur MRP-170 handles also perforated material. The magnet consumes significantly less air than vacuum grippers, because compressed air is used only to switch the magnet on and off. MRP-170 can handle solid and perforated material, flat and round parts, made of steel or cast iron alike.